This is an 'all sorts' post, you know, a post full of bits and pieces - which was a bit like our bank holiday weekend, some good, some bad. Let's get the bad bit over with first...I'm seriously have 'sewer's block' if there could be such a thing! I'm feeling a touch overwhelmed by life and can't seem to get myself motivated to either; stick at something I've started making or, more importantly, start something new. It doesn't help that I can never find a space at the dining room table as there always seems to be someone there before me. Household chores are mounting, the children have exams looming and everywhere I look there seems to be piles of stuff. Stuff, stuff and more stuff. Actually it's more like stuff and dirt and laundry. My car booting didn't result in much too..I'm sure you get the picture. The weather didn't help as most of the weekend was grey. Warmish but grey. 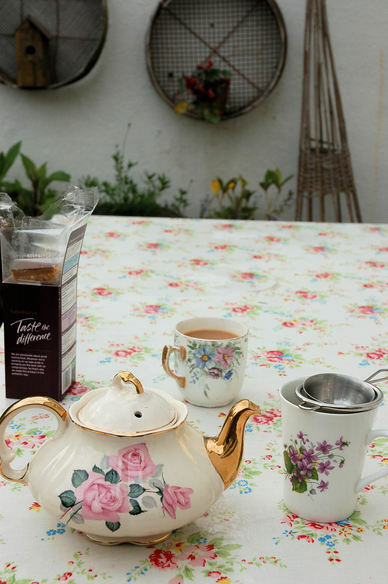 Warmish enough to have our first cup of tea at our outside table. Have you noticed my teapot? That was a gift from my father and my husband. I found it in Ludlow and yearned for it but it was too expensive for me to justify buying it even though it goes with my rose tiered cake stands; but it's gorgeous pink rosiness kept creeping into my mind and the family got fed up with me standing in Zani Lady (my favourite Ludlow shop) looking at it..so those 2 wonderful men bought it for me and, which is even more hilarious, agreed to have their photo taken holding it for the blog! The photo looks totally ridiculous with one holding the spout and the other the handle..so it remains 'unposted'. Do I hear a phew?! 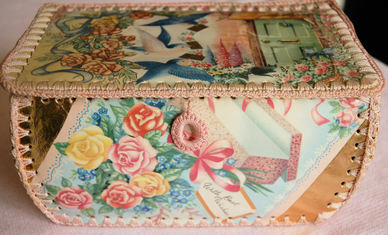 Next, I found this box on Amanda's stall in Totnes on Friday. 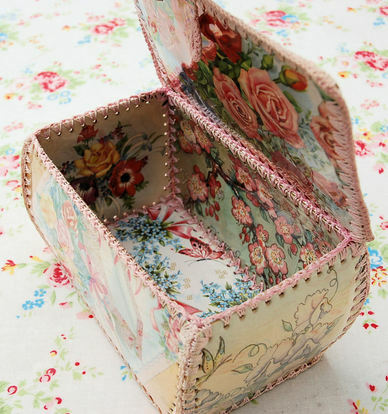 It is made from vintage cards which have had holes punched into them and then been crocheted together. I love it but prefer some of the pictures on the inside so am considering unpicking it and re-making it with the nicer pictures on the outside. 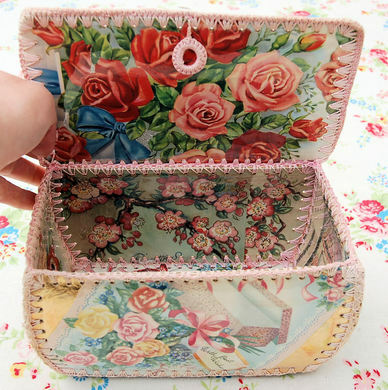 Does anyone know if these type of boxes had a name and does anyone have any ideas how to do the crochet bit? I'm a bit scared to unpick it but it does bother me that you can't see the best pictures; my favourite is the small side picture of the anemones and yellow rose sprig. Anyway, I'll be interested in your opinion. I've been meaning to show you my new bedside lamp. I originally bought it last summer in Zani Lady for the girls' room. It needed rewiring and it's taken me all this time to do it. 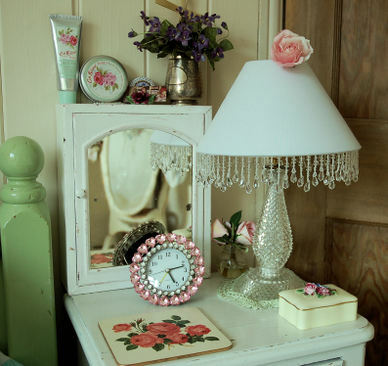 What I love about this lamp is that it is a product of other people's kindness. Firstly, the lady in Zani Lady. Before I bought it I was dithering about whether it could be rewired so she let me take it out of the shop, (without paying,no less) to get an opinion from the electrician up the road. She didn't know me and I thought that was very trusting of her, even though I left her one of my children! Secondly, when I decided recently that I could wait no longer and I must have it fixed; I was told that there would be a 14 day wait. A fellow customer overheard and being an electrician, did the necessary rewiring then and there, in the shop - and charged me nothing! And finally, after making a total hash of trying to stick the beaded trim on the shade with double-sided sticky tape - sweet Lisa spent a good 45 minutes during our crochet afternoon sticking it on properly! So, every time I look at it I'm reminded of the kindness of strangers and the very considerable talent and patience of my dear friend..
..and that, my friends is the end of my ramblings...and this was only going to be a short post..! !